Decorative bollards enhance the appearance of your property. Add value with our decorative posts. Decorative Bollards will enhance the appearance and value of your building or landscape. These decorative posts and chain barriers are also a good looking solution to control human or vehicular traffic. Used by commercial buildings, resorts, horse stables, residential and historical property owners. Add a boundary of distinction to your property along gardens, walks or driveways. These decorative posts and chain barriers are made of high density polyethylene with UV inhibitors to resist fading. Also resistant to cracks, dents, weather and insects. Very lightweight, our decorative bollards look like cast iron and are maintenance free. They never need painting. 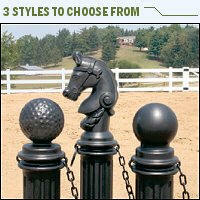 Decorative bollards are available in three styles, Classic, Golf Traditions or Hitching Post. Each post ordered comes with 6' of plastic chain, two S-Hooks and installation kit of anchors. Note that the plastic chain is not for overhead lifting or for weight bearing use. here are five installation options. Stand Alone by anchoring directly into the concrete or asphalt. Portable by using optional 10 pound rubber base. Post Mount using a 4"x4" treated post (not included). Bollard Post Surface Mount using Eagle model 1742 bollard posts (optional). Bollard Post Subsurface Mount using Eagle model 1744 bollard posts (optional). See our complete Decorative Post Installation Guide. Order decorative bollards below online. We also carry smooth post sleeves and ribbed bollard covers. See our complete selection ofindustrial safety products. 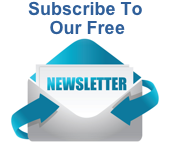 If you do not see what you need or have a specific need contact us toll free at (800)869-9633 or by email. Three styles to choose from - Classic, Golf and Hitching post. Use on walks, driveways or gardens. Use inside or out to control humans or vehicles. Our low cost decorative bollards will beautify your property .